After a short hiatus due to a new job and various fall-time shenanigans, Lauren is back for her second instalment documenting her european adventure. Click here to see details from her first stop in Barcelona. The next leg of our adventure brought us to a few cities in the South of France, a short train ride away from our starting point in Barcelona. With only a week to explore what may be one of my favourite parts of Europe, we decided to spend three nights in Marseille and three nights in Nice. These costal cities offered plenty of shopping and unique cuisines and were perfectly located for taking day trips, including an exquisite wine tour. For $121 each, we took a high-speed train from Barcelona and arrived in central Marseille about 6 hours later. 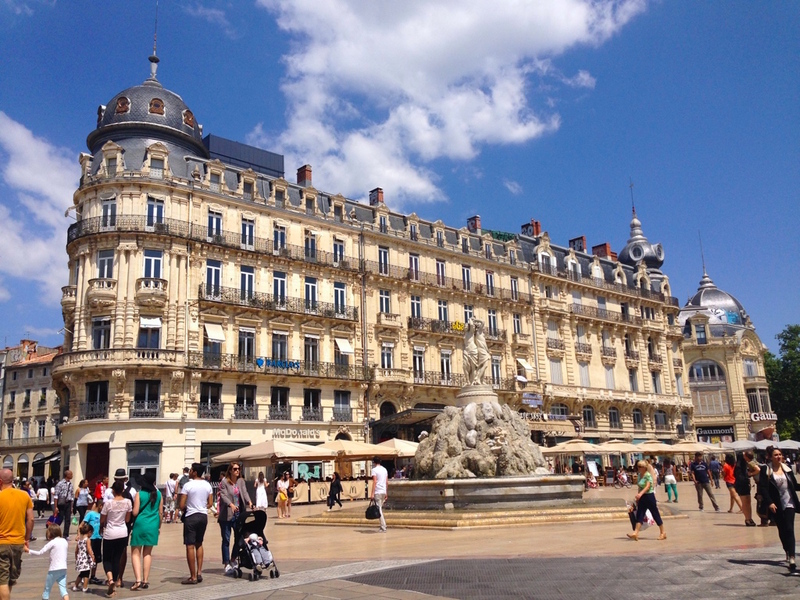 There were a few options when choosing our itinerary on the super user-friendly Rail Europe website, and we decided to go with a trip that included a 1.5 hour stopover in Montpellier, France. 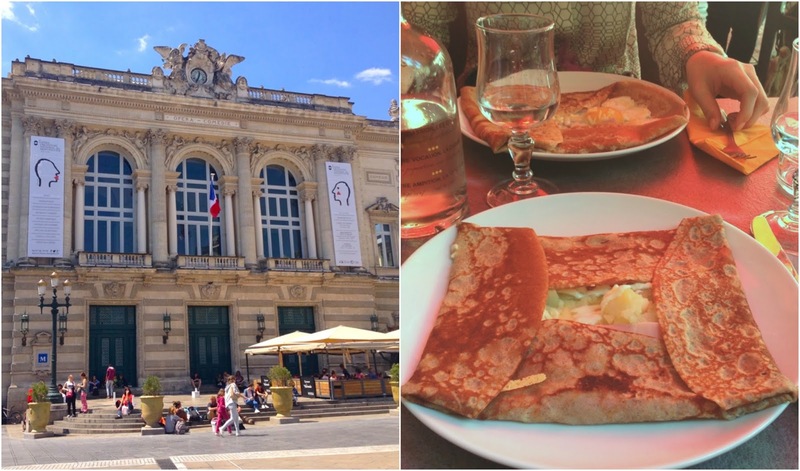 We enjoyed a delicious crepe for lunch on a bustling patio in the beautiful Place de la Comedie, however, we didn’t quite have enough time to truly relax or take in the sights so I would probably opt for a shorter stopover next time. 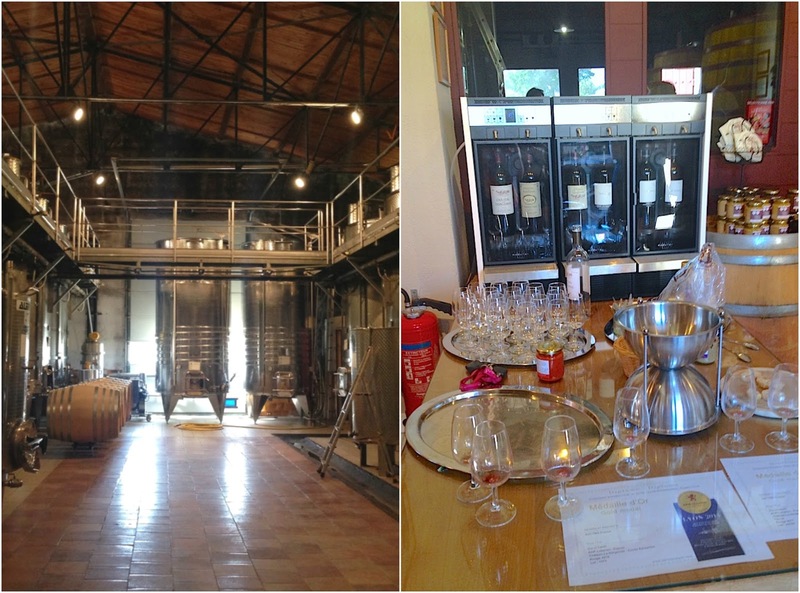 Going on a wine-tour immediately sounded like a good idea when planning our trip through France. 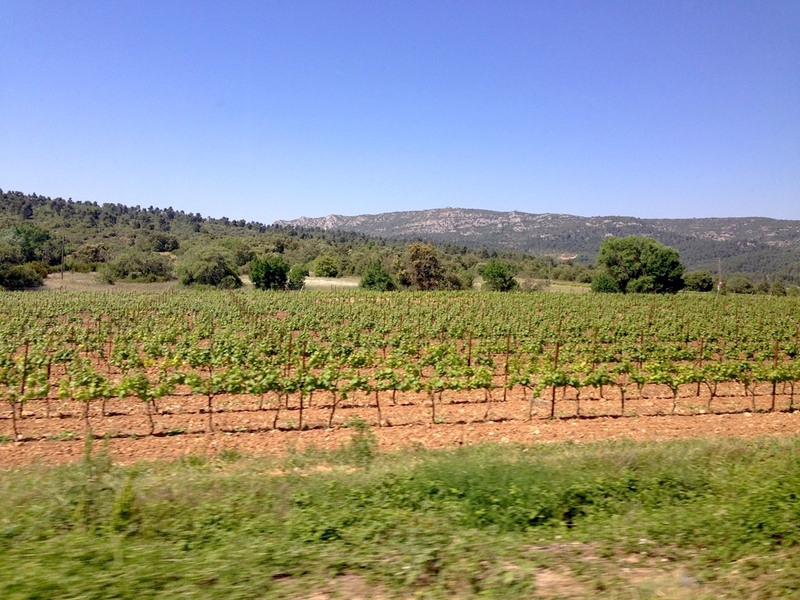 We reserved our spot a couple weeks in advance with the Provence Wine Tours company, which offered a 4-hour afternoon tour of two local vineyards at the reasonable price of 68 euros per person. 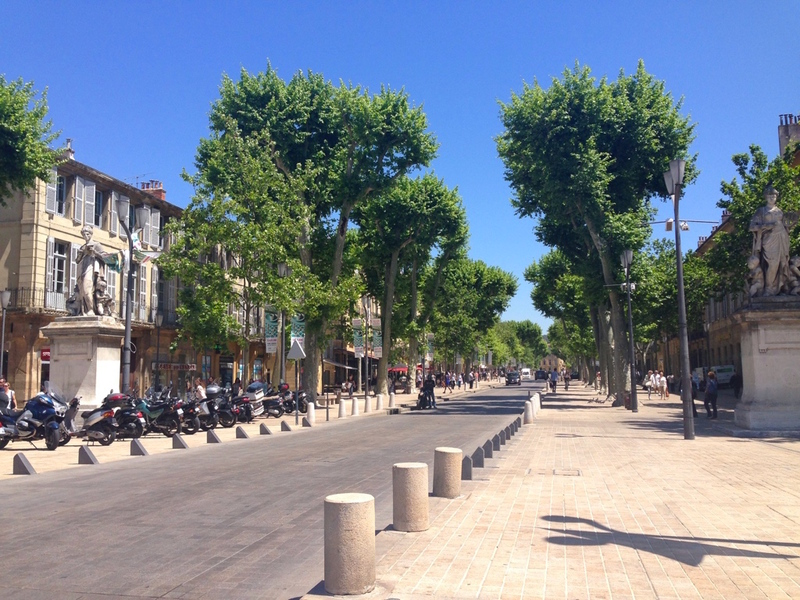 The best part - the tour bus departed from Aix-en-Provence, a quaint yet beautiful city one hour north of Marseille. 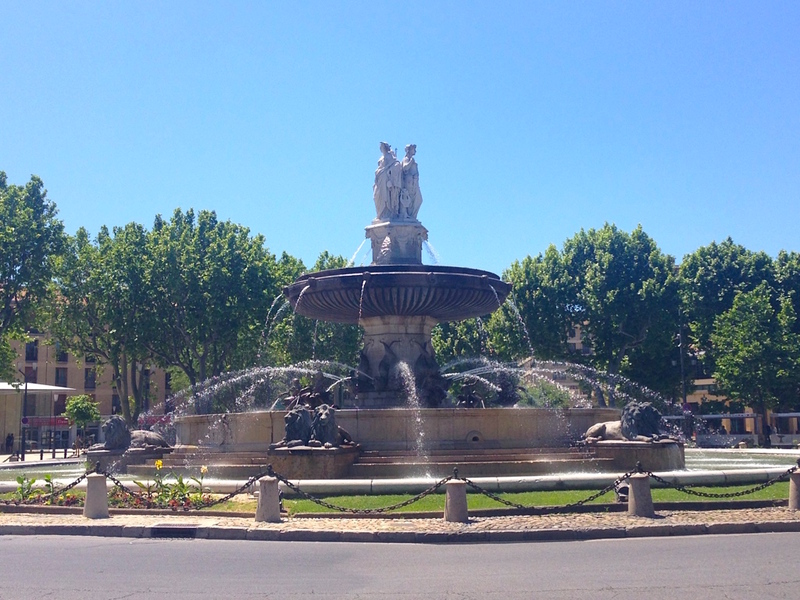 My mom has raved about the laid-back chic atmosphere and abundance of fountains in Aix ever since she visited 5 years ago so I couldn’t wait to experience it for myself. 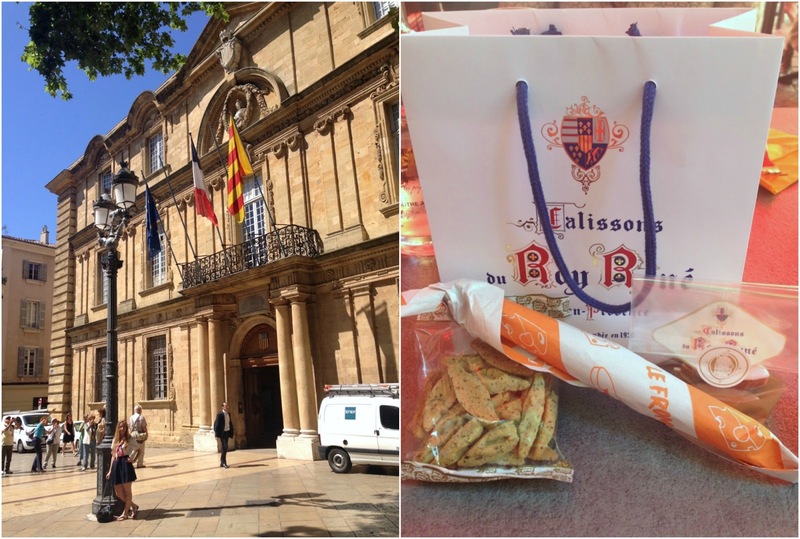 In Aix we enjoyed window-shopping along the Cours Mirabeau, had authentic Provençale food at Le Patacrepe and Le Bistro Latin, and picked up some locally produced herb navette crackers and calissons along the way. I found there to be something for everyone in this university town – high-end boutiques and restaurants, cute souvenir shops and markets, and distinctly European shoe stores and clothing retailers. We didn’t stay late enough to check out the evening entertainment, but I read reviews about a few fun bars in the area that I’ll be sure to check out next time. 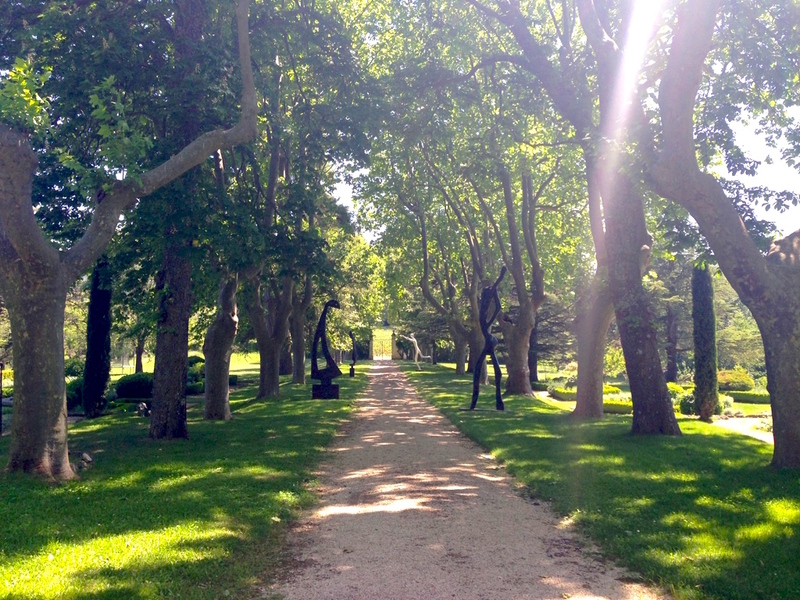 The weather was absolutely perfect for our afternoon tour of the Chateau Vignelaure and Chateau La Dorgonne vineyards. Our lovely tour guide had worked as a winemaker in various countries and helped us understand the winemaking process, label information and various regulations. She guided us through tasting nine samples of various quality “stages” of red, white and rosé wines as well as delicious mushroom and red pepper spreads produced with oil from the vineyard’s own olive trees. I hadn’t realized that nearly 80% of the wine produced in the Provence region of France is rosé wine – glad I found out with a few days left! What better way to start your morning than a solid climb from sea level to the highest point of a city? Sounds like vacation to me! 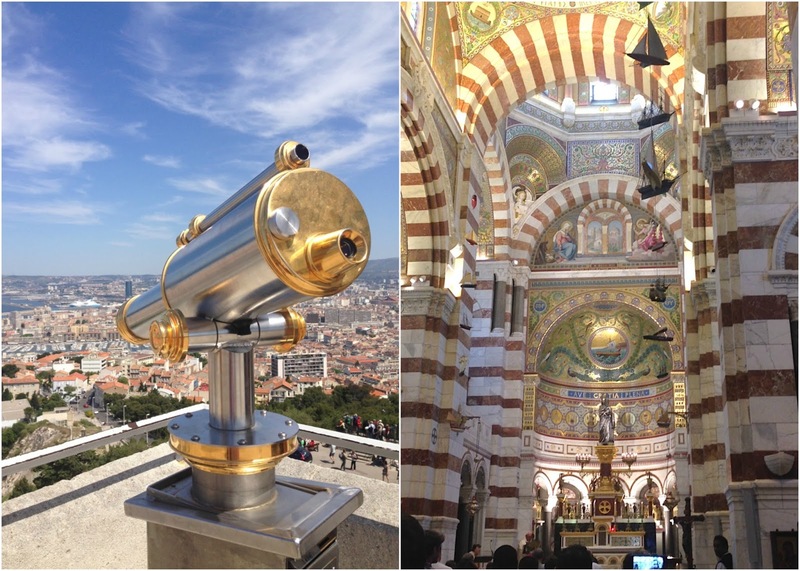 We could have paid a few euros to take a petite tourist train up to the opulent basilica Notre Dame de la Garde, but figured a bit of exercise wouldn’t hurt, especially in preparation for the abundance of French baked goods we were craving. Needless to say, the view from Notre Dame was just as incredible as the basilica itself. The distinct layers of white and green stone on the exterior of the church continued inside as layers of white and red marble, accented with colourful mosaics as well as small boats hanging from the ceiling to represent the nautical nature of the city. Many shops and restaurants are closed on Sundays so we spent an afternoon wandering through local streets and exploring the Palais Longchamp (which looks fresh out of a Disney movie) and Frioul Islands. We had originally bought ferry tickets to go to the island of the Chateau d’If, a 16th century fortress-turned prison, but ended up going to the neighbouring Frioul Islands because of more favorable boating conditions. Let’s just say that some things are meant to be! The Frioul islands were incredible. Aside from a short strip of restaurants and apartments, the rest of the island was untouched natural beauty. 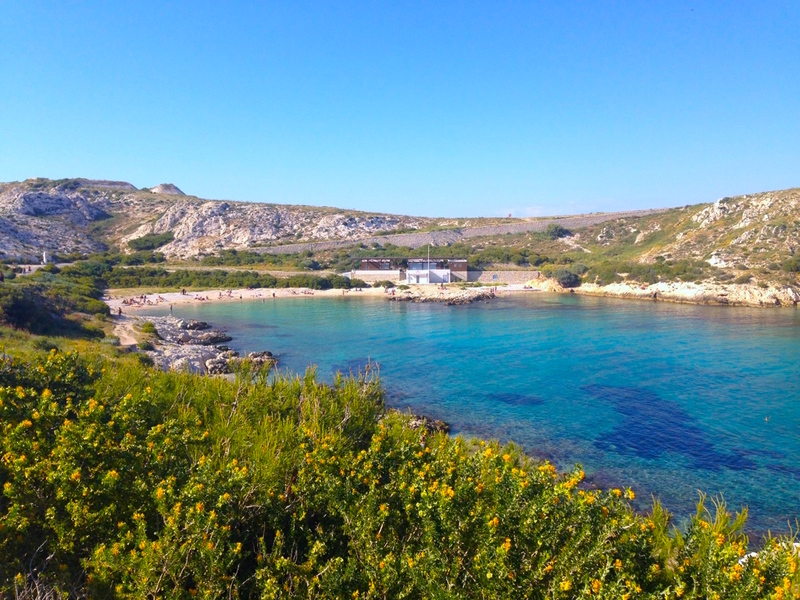 Walking trails lead from rocky inlets to small beaches, offering stunning views of sailboats and the old port of Marseille in the distance - the only thing we regretted was not bringing our bathing suits. Marseille has over 21 museums and coincidentally the night we arrived happened to be the annual Nuit des Musées (Night of the Museums) on which many venues stay open late and offer free entry. Without a doubt, my favourite was the recently opened Museum of European and Mediterranean Civilizations, known as the MuCEM. With its location on the pier of the Port of Marseille overlooking the sea, and connected to the 17th century military building, Fort St. Jean, this spectacular modern museum is hard to miss. I truly enjoyed exhibits about the history of the Mediterranean and sacred sites shared by followers of Judaism, Islam and Christianity. Choosing accommodations in a busy port city like Marseille was a bit challenging. Several Hostleworld and Tripadvisor users cautioned against staying in neighbourhoods near the Saint-Charles train station. Although conveniently located, this area is poorly lit and not so welcoming in the evening. Luckily, a friend recommended Hostel Vertigo Vieux-Port, which offered clean spacious rooms, friendly staff, simple (but free) breakfast and was a short two blocks from the old port “downtown” area. 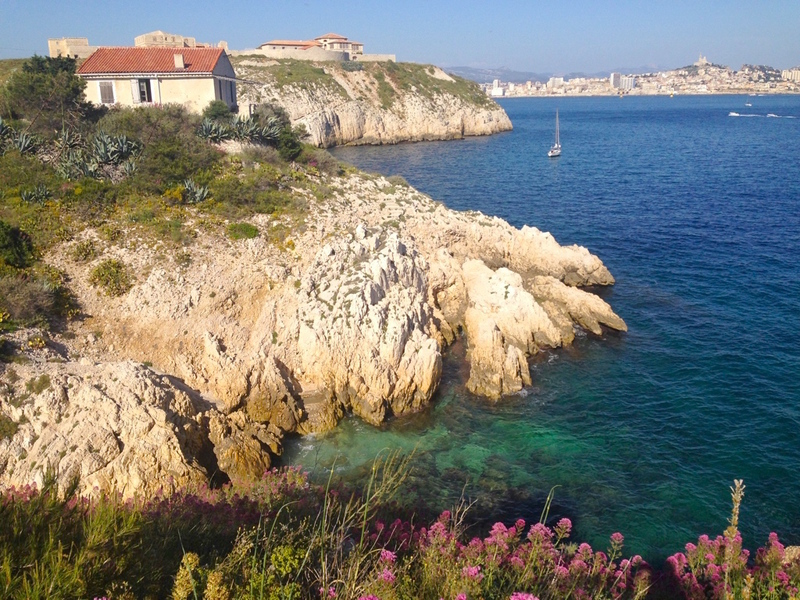 As a Mediterranean port, Marseille became home to waves of immigrants in the 20th century from Italy, Greece, Russia, Vietnam, and North Africa. These cultural influences really shine through the variety and quality of restaurants and shops. 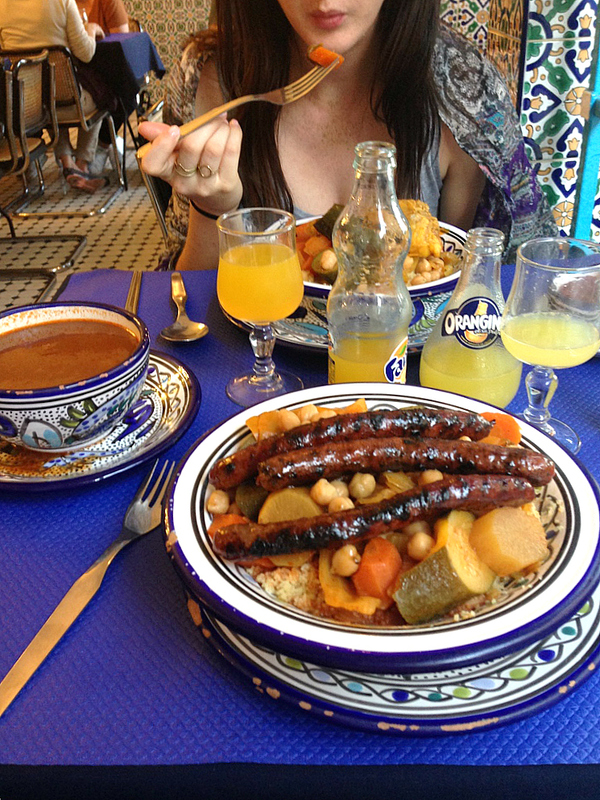 We particularly enjoyed huge portions of stew at a Tunisian restaurant, La Kahena, finished off with the most incredible mint almond tea (which I am desperately trying to find back home in Toronto). 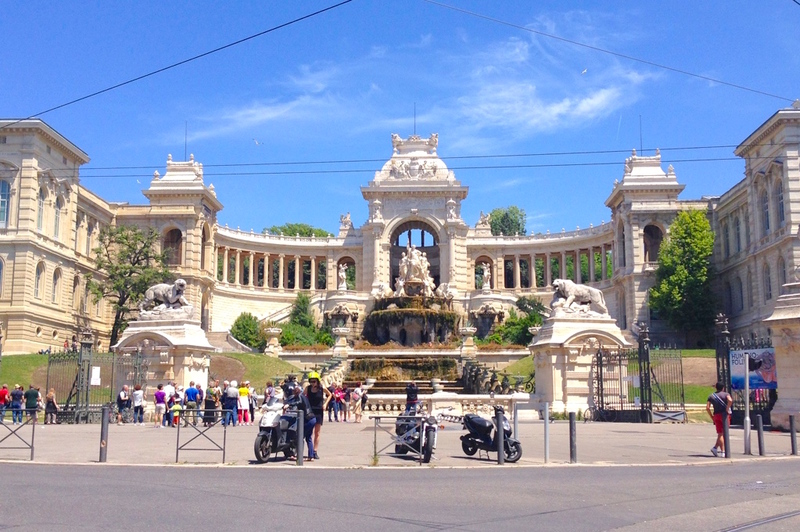 Marseille was a fun place to visit and was a perfect hub for travelling to smaller nearby cities like Aix-en-provence. Though it wasn’t the cleanest city I’ve seen, we still enjoyed the company of friendly locals and had plenty to keep us entertained over our three night stay. 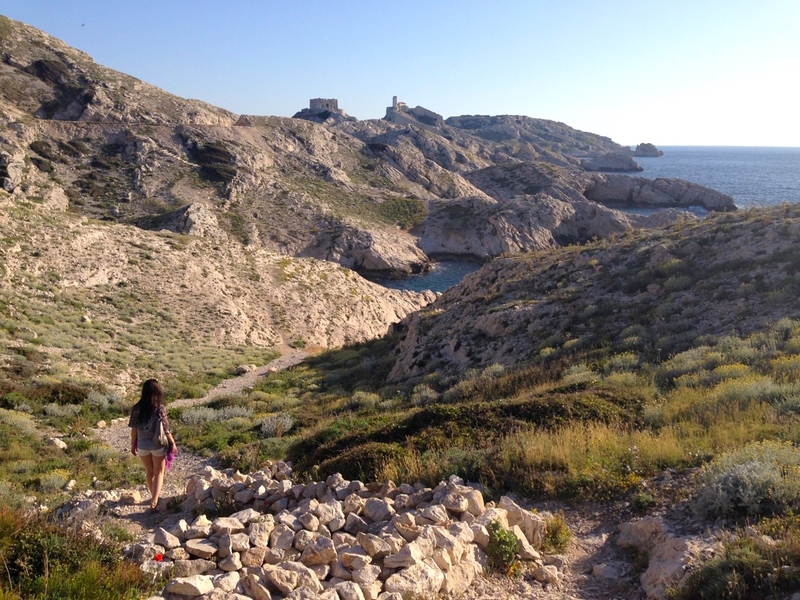 If you'd like to see my review of Marseille from Summer 2014, click here.